With two young children, life is never dull and never anything but constant crazy! :) So how do I take time for myself to rejuvenate and refresh? I grab a cup of warming, delicious Grove Square Hot Cocoa or Cappucino that I make in seconds in my Keurig! My husband relaxes and rejuvenates with the Caza Trail Dark Roast, his favorite type of coffee! Our favorite time of the week is on Saturday mornings where we make our favorite K-Cup drinks and sit down and talk! I cherish those moments and Grove Square and Caza Trail has allowed us those moments by providing easy to make and quick -to-brew drinks that we both love and can fit into the moments of quiet that we get on a Saturday morning while the kids are playing! For all the other parents out there like me and my hubby, Caza Trail & Grove Square offer single serve cups (compatible with Keurig® K-Cup® brewers) in delicious flavors of coffees, teas, cappuccinos, cocoas & ciders. These new favorites bring us that much needed sip of indulgence with each captivating cup. Whether you prefer French Vanilla Cappuccino, a strong dark roast or donut shop cup of coffee or a tasty Hot Cocoa, Caza Trail Coffees & Grove Square Specialty Beverages offer the perfect accompaniment for the whole family. I absolutely LOVE knowing that if I want a warm, comforting drink at a moment's notice, I just stick in these great Caza Trail or Grove Square K-Cups and my favorite drinks are done in seconds! They taste really great and are perfect for warming up this winter, especially where I live in snowy Minnesota! I was afraid that the Hot Cocoa and Cappuccino (which I have never brewed before in my K-Cup) would be watered down or tasteless...but I was wrong! It tasted just like I wanted it to..full of flavor, rich and chocolatey, and so, so comforting and warm! They were perfect drinks for a snowy, cold winter day! 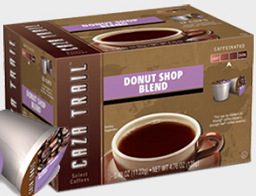 Buy It: You can purchase Grove Square and Caza Trail K-Cups from Amazon.com. Win It: (1) Box of Donut Shop Coffee to a lucky winner!